The 1834 Crosslet 4 is a rare date in the Classic Head Half Eagle series. The Mint Act of 1834 reduced the gold content of US coinage for the purpose of thwarting bullion speculators, who were exporting and melting gold coins almost as soon as they left the Mint. The lighter weight half eagle was readily distinguished from its predecessors with the Classic Head Half Eagle design, introduced in 1834. Designed by Engraver William Kneass, Lady Liberty adopted thick, curly hair, with a slightly more masculine look. The reverse remained much the same as before. The 1834 Classic Head Half Eagle comes in two varieties: the Plain 4 and Crosslet 4. The latter is characterized by a small serif attached to the horizontal portion of the numeral 4. The Crosslet 4 is one of the rarest Classic Head Half Eagle, a fact long acknowledged by collectors. 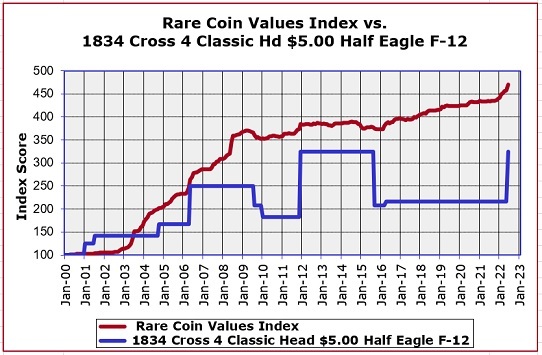 The blue line in the graph above illustrates the percent value increase of the 1834 Crosslet 4 Classic Head Half Eagle in F-12 condition since Year 2000. The coin is considered very desirable by coin collectors, yet is falls below the performance of the Rare Coin Values Index, as charted by the red line. The Index measures the composite percent change since Year 2000 of a representational group of 87 rare US coins, the purpose of which is to understand the strength and direction of the overall rare US coin market. The 1834 Classic Head Half Eagle Crosslet 4 is one of the 87 coins that make up the Index. All charts are updated monthly.